As in the rest of Latin America, since the 1990s migrant remittances have become an important source of foreign exchange for the Cuban economy. Their significance was accentuated as the Havana government, facing the Special Period, legalized the possession of dollars. The response of the émigré community was swift, with remittance flows, according to disparate and often conflicting estimates, increasing appreciably during the 1990s and into the 2000s (Pérez-López and Díaz-Briquets, 2006, 407). Major contributing factors, aside from the dollarization decision, were a major rise in the migratory flow from Cuba to the United States following the 1994 U.S.-Cuba Migration accord, accompanied by historically low unemployment rates and rising wages in the United States, including in South Florida, the region where most recent Cuban arrivals settle. Beginning in 2007, and partly induced by the cyclical nature of economic activity, the weakening dollar and the financial consequences of the Iraq and Afghanistan wars, the American economy growth rate began to stagnate. This has been reflected in a rising unemployment rate, declining real wages, increases in the cost of living, and growing difficulties for many workers, particularly new labor force entrants, to find employment. Among Hispanics, the unemployment rate has risen faster than for the population as a whole, standing in July 2008 at 7.7% and 5.5% respectively, mostly because of construction job losses (Lazo 2008:D2). These difficulties have been in evidence in Florida where, according to official statistics, the state lost close to 75,000 jobs between May 2007 and May 2008 (Florida Research and Economic Database 2008), despite continued population growth. In the Miami area—the metropolitan area with the ninth largest population increase in the nation—455,869 inhabitants were added between April 2000 and July 2006 (Florida Agency for Workforce Innovation 2007:3), a trend that aggravates the employment situation as a growing number of workers seek fewer available jobs. Close to half of this demographic growth can be attributed to Cuban immigration, a trend sustained by their continued and unrestricted arrival through mid-2008 thanks to the Migration Accord and the Cuban Adjustment Act. The slowdown of the U.S. economy has had a considerable impact on the amount of migrant remittances being sent to Latin America, according to results of a recent nationally-representative sample survey of 5,000 immigrants released by the Inter-American Development Bank, IDB (2008). Results suggest that the remittance growth trend has slowed down, with the percent of migrants sending money back home on a regular basis declining by one third, from 73% in 2006, to 50% in 2008. A likely cause of the inflection in the trend is that close to 40% of respondents to the IDB survey reported earning lower wages in 2008 than in 2006. These adverse trends were largely offset by increases in the annual frequency with which remittances were sent by migrants (rising from 12 times a year in 2006, to 15 in 2008), resulting in a modest rise in the average value per remitter, from $300 in 2006 to $325 in 2008, or by 8.3%. In net terms, annual per capita remittances declined from $4,875 in 2006 to $3,600 in 2008, or by 26%. Data on remittances to Mexico, released by the country’s Central Bank, indicate a similar but not as pronounced remittance decline of 2.2% in the first six months of 2008 as compared to the same period in 2007, with the total value of remittances dropping from $11.9 billion to $11.6 billion (Lazo 2008:D1). While the IDB survey does not provide detailed data on the Cuban émigré population, certain inferences can be drawn from its national results. The first is that the volume of remittances sent to Cuba probably was adversely impacted by the same economic variables that contributed to the slowdown in remittances sent by the broader Latin American immigrant U.S. community. Mention was already made of the rising joblessness rate in Florida aggravated by the continued growth of the South Florida population. Furthermore, as in the national economy at large, job losses were concentrated in economic sectors were recent immigrants cluster, such as construction and non-professional services. The impact of the housing crisis has been particularly onerous in Florida, where mortgage foreclosure rates are amongst the highest in the nation. The depth of the economic deterioration in South Florida is suggested by a remarkable increase in the number of “soup kitchens” in the region. By July 2008, it was estimated that more than 800 social welfare agencies, from West Palm Beach to the Florida Keys, were providing food assistance to some 800,000 needy individuals (Shoer Roth, 2008). This situation had not been seen in the region in many years, and partly responds to appreciably increases in food costs, but in all likelihood also responds to higher unemployment. Counteracting these negative developments with respect to the remittance flows generated by the Cuban- American population has been the continuous and uninterrupted arrival of new migrants, a development at variance with that reported for other Latin American countries. Migration arrivals from the latter countries are generally believed to be diminishing due to the economic downturn, tighter enforcement of undocumented migration provisions, and the reluctance of some would-be migrants to face increasingly discriminatory and harsh practices in a tighter U.S. labor market. Favoring the continuation of the rising trend of remittances to Cuba are also closer family links between new arrivals and their remaining relatives in Cuba, together with a growing cultural acceptance of remittance behavior among the South Florida Cuban- American émigré community. Lastly, improved telecommunications between the South Florida enclave and Cuba also tends to sustain and encourage remittance behavior. Developments in the national economy and in South Florida, plus the steady increase in the arrival of Cuban immigrants suggest that while the volume of remittances to Cuba may be sustained by the rising number of new arrivals, it could be simultaneously affected inversely by the worsening South Florida economic picture. As Pérez-López and Díaz-Briquets reviewed in 2006, the annual amount of remittances to Cuba, according to (1) balance of payments estimates; (2) surveys of remittances senders; (3) estimates of capacity of migrants to remit; and, in one occasion, (4) a small, nonrepresentative survey of remittance recipients has yielded a rather broad set of estimates. Disparities are undoubtedly associated with the variety of estimating approaches used, as well as methodological difficulties. Results yield estimates ranging from a few hundred million dollars a year (clustering around $300 million annually) to over one billion. In this paper I seek to assess the robustness of past remittance estimates by contrasting them with data from a nationally representative telephone survey of Cuba conducted in August 2007 (Díaz-Briquets and Pérez-López 2007). The Cuban Economy telephone survey was designed to assess the economic situation of the country based on a questionnaire specifically crafted for that purpose. Its objective was to elicit public perceptions on the condition of the Cuban economy at large and of households at the time of the survey and in comparison with 12 months earlier. In addition, the survey sought to determine perceptions about selected economic issues, including remittances. The survey relied on a sample design consisting of four strata of Cuba’s main regions (Eastern, Central and Western provinces, with a separate sub-sample drawn for the Ciudad Habana province), each with 300 respondents, providing a +/- 8% margin of error and a 95% confidence interval. When appropriately weighted, by apportioning respondents through a procedure proportional to population size in each region, the four combined sub-samples yield a nationally representative sample of 1,200 respondents with a +/-2.8% margin of error and a 95% confidence interval. Clearly, the telephone survey results cannot be ascribed to the Cuban population at large as they are only applicable to the population of telephone land line subscribers. A reasonable assumption is that the vast majority of phone lines in Cuba are located in urban areas and among economically better-off households, an assumption validated by survey results. Cell phone users were excluded as sample selection relied on Cuba’s latest telephone directory listings, which only provide land line numbers. In drawing the sample, official and business numbers were segregated from those of private residences. The survey includes respondents contacted in 90 of Cuba’s 169 municipalities, for a 53.9% municipal coverage rate, distributed across the length of the country, including Isla de la Juventud. Remittances currently constitute one of Cuba’s primary sources of foreign exchange. Yet, very little is known regarding the approximate number of households benefiting from remittances, how much on average they receive, with what frequency and how, the countries where remittances come from, and how remittances are used. Some answers to these questions can be gleaned from the survey results. The survey found that 14.8% of respondents reported that their households received economic assistance from relatives abroad. 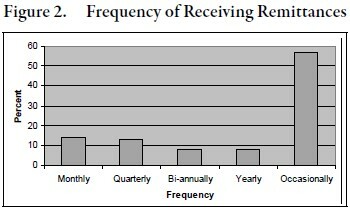 This percentage may overstate the actual percentage of households receiving remittances, as the sample only refers to households connected to telephone land lines. However, it is considerably below the 34% estimate obtained by Blue (2004) for City of Havana households using a snowball sample, although according to the telephone survey (see below) remittances are received by Havana households at much higher rates than other regions of Cuba. Respondents from the telephone survey of households, as noted above, can be assumed to be, on average, better educated and predominantly urban. Thus, it is reasonable to assume, based on a general understanding of the nature of emigration from Cuba over the last five decades, that such households are more likely to have relatives abroad. Most emigrants have urban backgrounds and were, until recently, better educated than the average Cuban. 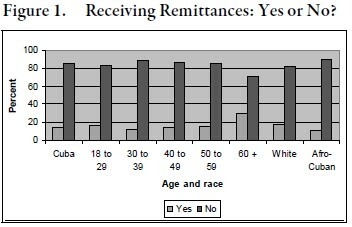 Older respondents (60 years of age and over) reported receiving remittances twice as often (30%) as younger respondents (Figure 1), while the reception of remittances by White respondents (17.7%) was nearly twice as high as for Afro-Cubans (10.6%). This finding is generally consistent with impressionistic accounts that suggest that Afro-Cubans have benefitted proportionally less from remittances than White Cubans given the historically higher emigration rate among the latter than the former. Remittances flow to urban households (15.2%) at a 50% higher rate than to rural households (10.9%), with the percentage of Havana recipients (27.3%) being nearly double that for Western (16.6%) or Central (14.4%) Cuba. Eastern Cuba (7.3%) lags behind all other regions in terms of remittance receipts by a wide margin, more so with respect to Havana, at only one-quarter the capital city’s rate. Slightly more than half of households receiving remittances do so on an occasional basis (Figure 2), with the balance being nearly equally divided among those receiving them on a monthly, quarterly, yearly, or bi-annual basis, in that same order of importance. Fewer than half of Havana recipients report the occasional receipt of remittances, whereas seven out of ten Eastern Cuba recipients do so. The findings from the Cuba telephone survey can be contrasted with those of the 2008 IDB survey for Latin American immigrants in the United States regarding the frequency with which remittances are sent. The Cuba telephone survey data suggests that senders to Cuba remit data with much lower frequency, a finding consistent with the relative difficulties of remitting to Cuba, including the existence of legal restrictions. Four out of ten Cuban recipients of monetary transfers claim to do so through friends (including people they know), with an additional 40% declaring they receive them through formal banking mechanisms, such as wire transfers and debit cards (Figure 3). Money transfer companies account for an additional 20% of remittances, and “mules” (professional travelers who carry cash) for the remaining 2%, although some mules may have been reported in the survey in the “people they know” category. 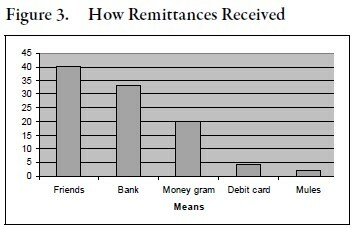 A much higher percentage of respondents to the 2008 IDB survey than of recipients responding to the Cuban telephone survey allege to rely on formal mechanisms (bank and credit cards) to remit, with only 12% of the former claiming to rely on mail/courier and friends to receive remittances. In contrast, nearly four times as many Cuban households reported receiving remittances through friends and mules. About half (49.4%) of those reporting receiving remittances in Havana claim to do so through people they know, with significantly lower percentages availing themselves of bank transfers (25.3%) or money transfer companies (13.8%), in contrast to other regions of the country where the latter two predominate. Only in Havana (9.2%) and Western Cuba (4.0%), a region that includes the area surrounding the capital city, is the use of debit cards reported. These patterns are consistent with the more frequent visits of foreign visitors to Havana and greater access to modern banking facilities in the capital as compared to other regions in the country. 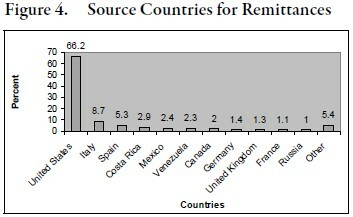 The vast majority of respondents (66.2%), not surprisingly, indicated receiving remittances from the United States, followed by Italy, Spain, Costa Rica, Mexico, and a dozen other countries, as shown in Figure 4. No clear patterns are discernible by demographic or socioeconomic background variables, other than the percentage of those indicating receiving remittances is lower for Eastern Cuba than for other regions of the country. 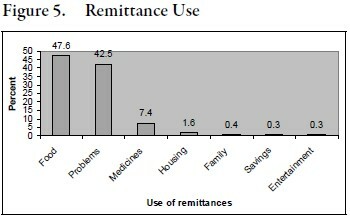 About half of remittance recipients report using them to purchase food (Figure 5), with four out of ten claiming to rely on remittances to take care of “problems.” Significantly smaller percentages use remittances income to purchase medications and to attend to housing-related issues. Minute portions are said to be saved or used for entertainment. 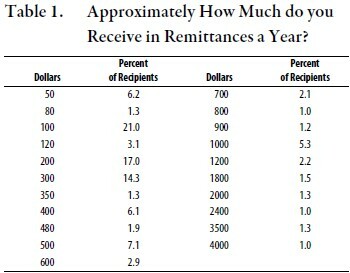 The amount of remittances received varies significantly, as shown in Table 1. The reader is cautioned that the data must be carefully interpreted, as the number of respondents reporting receiving remittances who were willing to indicate the amount received is small (81 in total). Furthermore, survey income reports are notoriously unreliable, regardless of the country where they are conducted. While the largest number of remittance recipients claim to receive $100 (21.0%), $200 (17.0%) or $300 (14.3%) a year, 13.6% of them reported receiving $1,000 or more annually. The annual average for the sample is $450. The latter figure is considerably below the mean estimated by Blue for her Havana sample ($752 per household), and well below the average household remittance level suggested by other estimates for Cuba, whether obtained from balance of payment statistics, surveys of remittances senders, or derived from simulations based on emigrant income data and household characteristics. The telephone survey findings suggest that global remittance flow estimates to Cuba based on other sources of information may be somewhat inflated. A major source of uncertainty is the well-known tendency among survey respondents to underreport income data, a problem probably magnified in Cuba by the many government-imposed restrictions on economic activities, a bias that could well have impacted the estimates obtained with the Blue and telephone surveys. In any case, it is significant that there is a coincidence between the two Cuba-based surveys, a matter deserving further analytical attention. The evidence reviewed in this paper, while tentative in nature, suggests that the current flow of remittances to Cuba is being adversely affected by the slowdown in the American economy. This conclusion is buttressed by parallel developments revealed by remittance flow survey data for other Latin American nations. This could not have happened at a worse time for the country. The continued domestic agricultural crisis, together with a rising import bill associated with higher food prices — induced by a global shift of food crops to the production of biofuels—together with declining nickel prices and the destructive force of hurricanes, are stressing the Cuban economy. How substantial is the remittance flow change is difficult to estimate but it might be considerable given the geographical concentration of the Cuban émigré community in South Florida, a region battered by the housing crisis, and experiencing rising unemployment and higher poverty levels. Counteracting these effects is the continued arrival of Cuban migrants in South Florida and their cultural proclivity to assist their relatives in Cuba. Equally significant is that the telephone survey results suggest, if tentatively, that the volume of emigrant remittances to Cuba may be far less than previously assumed. Such finding is consistent with that of the only previous household survey described in the literature within Cuba reported by Blue (2004). 1. Mario González-Corzo provided valuable comments to an earlier version of this paper. Sergio Díaz-Briquets is a Northern Virginia based international consultant focusing on governance issues.